← Mr. President, Release the Kraken! See no evil, hear no evil, speak nothing but evil. This is the maxim of the liberal leftist Democrat media. This is the truth of Rush Limbaugh and why he must present the actual facts of liberalism in order present conservatism to give people a chance to choose wisely. Liberals can never represent themselves or conservatism truthfully. They must call conservatives racist, Nazis, sexists, and homophobes. They must create the lie that they are for benefiting the little guy when they only want to dupe them into surrendering their liberty. 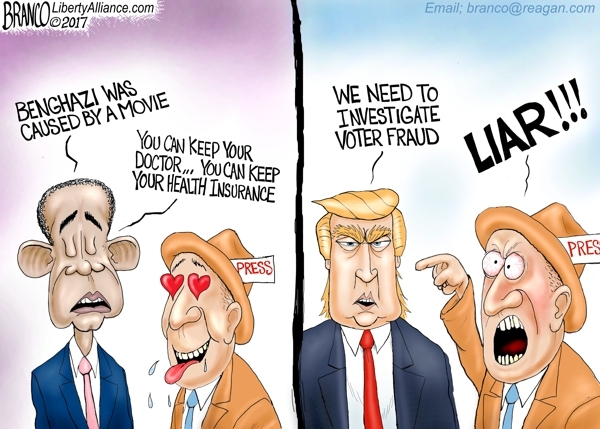 They can never tell the truth or just report the simple facts about Trump, but must smear and slander him with their opinions for everything he does. In their eyes Trump can do no right and Obama has done no wrong. They create as great a fraud in everything they do and say as their global warming scam. When President Trump coerces North Korea to give up three American hostages at no cost, unlike Obama who traded terrorist leaders and billions of dollars for hostages held by Iran, they mudsling at Trump where they kissed Obama’s backside. The Democrat Party’s agenda is to tear apart America through division politics, divide and conquer, and then do away with the Constitution to remake America as a socialist dictatorship. Democrats have always wanted imperial rule from the founding to have the masses serve the elites. That has never changed. They fought a war to keep their slaves. Now they are fighting a war of subterfuge to dupe people into becoming their slaves voluntarily. So long as they can fool people that they are for the little guy and Republicans are only for the richest 1% they can delude their followers into doing anything they say will steal wealth from those who work for it and give it to them. That’s why Democrats endorse criminals, thieves, invaders, and even foreign terrorists. Liberals are using robotic elements on the Internet to create phony massive public support for their lies in order to coerce businesses into supporting their agenda. Like their propaganda, there is nothing about liberalism that is true except that they represent a minority of Americans who hate this country. Most of the Democrat Party consists of America haters, criminals, foreigner invaders, phony Internet bots, and voter fraudsters. Put ICE agents in all the polls in California and New York and watch 20% of their voter base melt away. Take away their bots on the Internet, stop their censorship through Facebook and Google, and suddenly liberals will be seen for the small minority they are, and conservatives will stand out as proudly as the majority as they should. This entry was posted in Politics and tagged Democrat haters and liars, Democrat Party, Donald Trump, Liberal media propaganda, Republicanism, Rush Limbaugh. Bookmark the permalink.